As I head off to see my 7th grader (seriously, where did the time go? #nowaycanhebethatold) play some Falcon Football later today, I wanted to share this card using this amazing snowflake stamp set called Lots of Snowflakes from Simon Says Stamp. 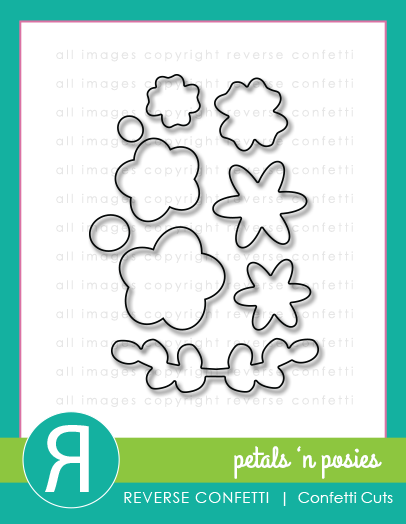 I immediately fell in love with this particular snowflake stamp in this set......even better there is a smaller version too! I decided to white heat emboss them onto Tim Holtz watercolor paper. I watercolored a mixture of Broken China and Tumbled Glass Distress Inks over the top for a resist effect leaving some areas darker than others. My favorite technique EVER! 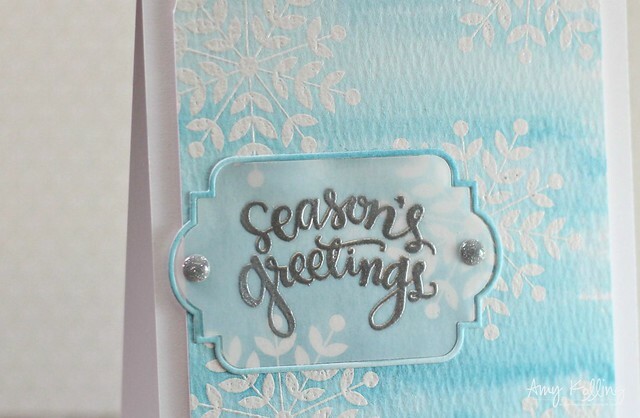 Here's a close up of the silver heat embossed sentiment from Peace on Earth from Simon Says Stamp and the tiny frame die from the Frames Die set. 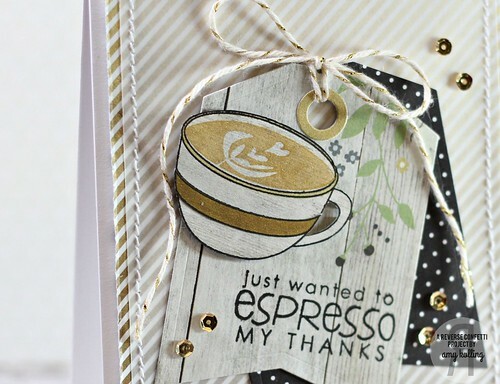 A quick post tonight.......I couldn't resist posting another "coffee" themed card for the Coffee Lover's Blog Hop! Check out Cutscropscreativity for all the details as well as all the PRIZES up for grabs! 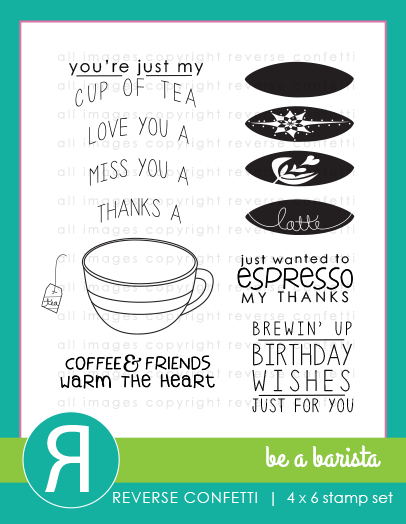 This card uses some fabulous pattern paper from Simple Stories (the story of US) along with the Be a Barista stamps from Reverse Confetti. I stamped my coffee mug onto pattern paper and paper pieced a gold strip onto the mug and cut out. 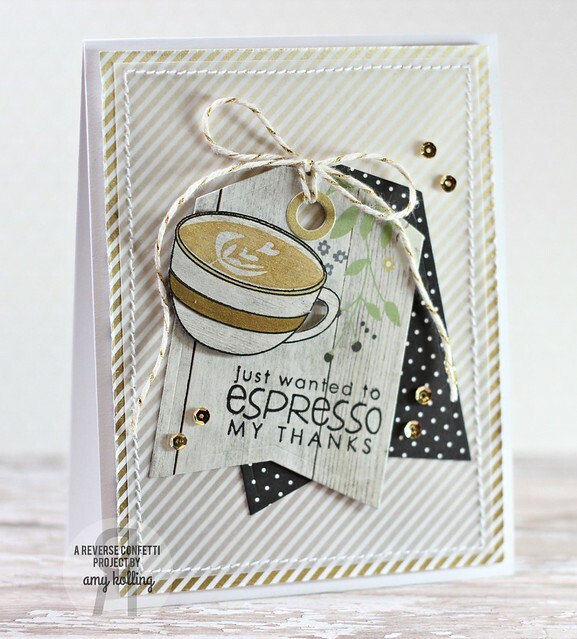 I stamped one of the coffee images in Gold Delicata ink to finish it off. I am playing along with a new to me challenge: Tag You're It! Challenge. I found Gayatri's layout and bold black tag to be my inspiration. 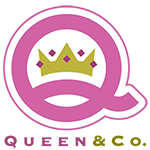 There is a fantastic Blog Hop happening today! Check out Cutscropscreativity for all the details as well as all the PRIZES up for grabs! 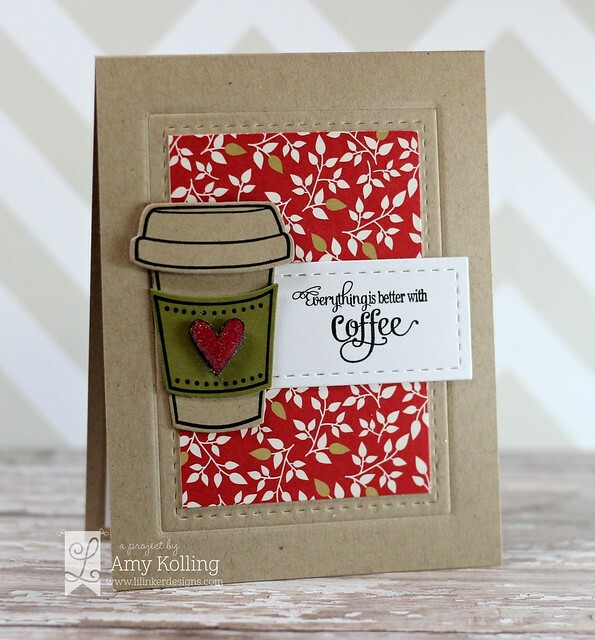 I needed this blog hop to make me use some of my sorely neglected coffee stamps. 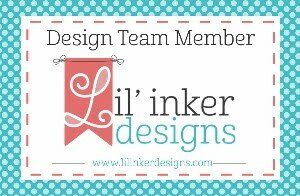 This set is the Coffee Cozy set and coordinating dies from Lil' Inker Designs. I started by using one of the Stitched Mats: Rectangles and impressed it into my card as a frame. I kept the rest fairly simple with using the coordinating Coffee Cozy Dies. Since my card has "red" on it, I'm playing along with the Catered Crop "Seeing Red" Recipe Swap! Don't forget all the prizes up for grabs during this blog hop! Thanks for sharing a part of your day with me! 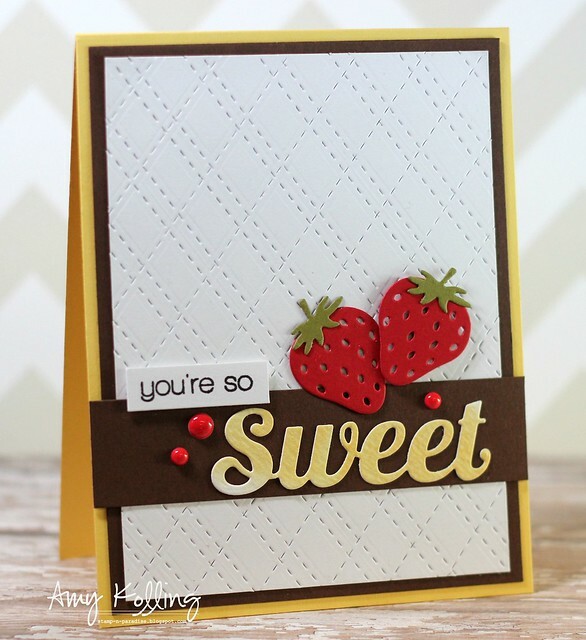 I adore this strawberry die from Whimsy Stamps. 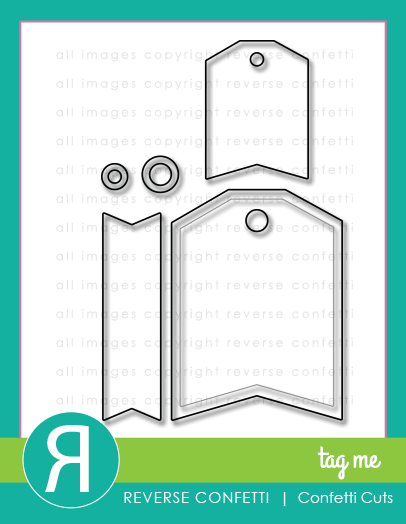 It is so detailed and makes for an easy card accent or focal piece. 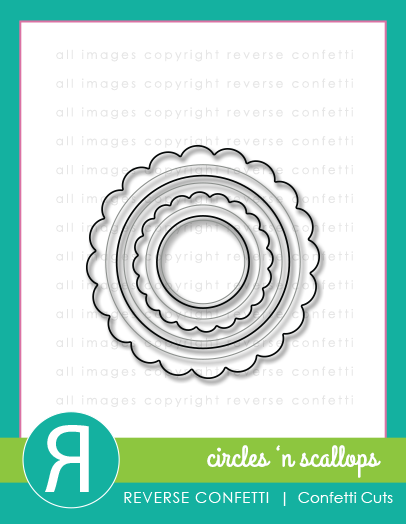 To go along with the country feel, I made my own pierced background using the Stitched Border Dies from Whimsy Stamps. I pieced together a sentiment from Sweet as Candy and paired it with the Sweet die all from Whimsy Stamps! The Sweet die was cut from a Distress Ink watercolored piece of cardstock. 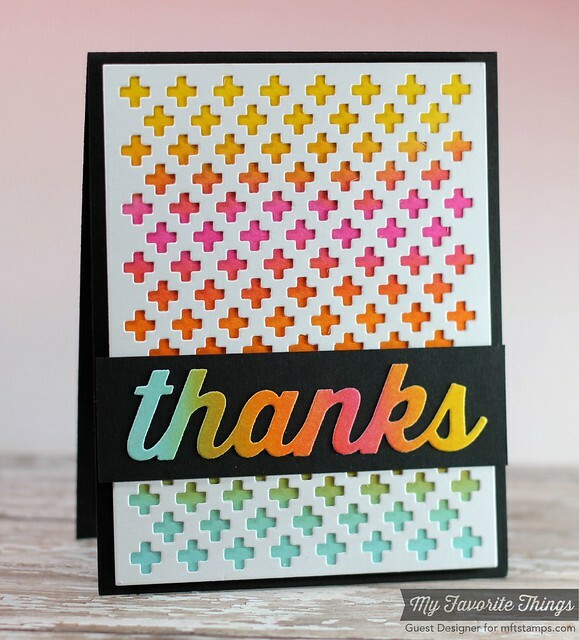 Since this week over at Simon Says Stamp Wednesday Challenge it's "Anything Goes", I am going to link this up over there! I loved the look Melania used down the left side of her card with the die and COLOR showing through. I also liked the bold black focal point. I went with a color combo that I love.....yellow, gray, and black. I started by diecutting the Triangle Border and layering colored cardstock strips behind the border. 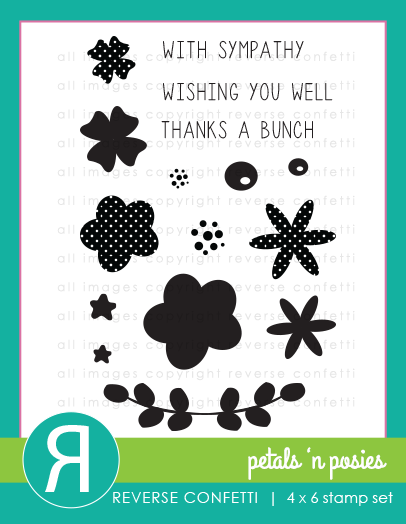 I diecut the speech bubble with black cardstock and white heat embossed the stamped sentiment from the Happy Bubble Set from Simon Says Stamp. The challenge closes in 2 weeks....... so what are you waiting for?! You can find everything you need to play along HERE. We can’t wait to see what you create!! I'm sending this over to the Simon Says Stamp Wednesday Challenge for Anything Goes! Reverse Confetti September Color Challenge! Hello friends! Whew.....it's been a very busy few weeks here and I took a very needed week off from blogging but not crafting! I hosted a fun weekend retreat last weekend with my good friend Laurie and let's just say that it was AMAZING! We are already planning retreat #2! There were lots of laughs, fun, and friendship. 16 ladies from all over the US came together for the weekend. MEMORIES were made for sure! 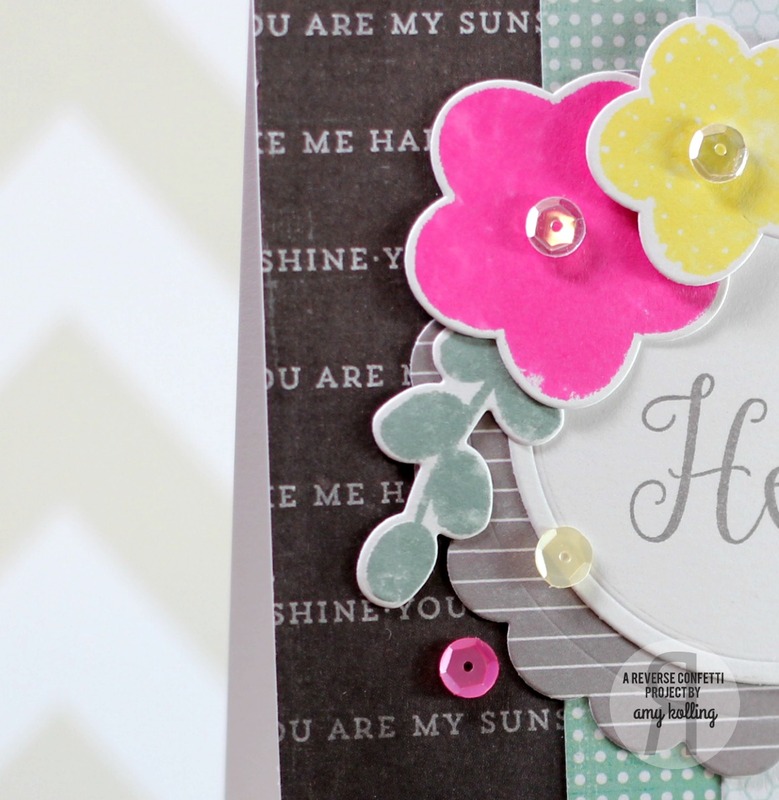 Have you seen the September Color Challenge over on the Reverse Confetti Blog? I used a panel I "blended" last weekend for my card using Distress Inks in Squeezed Lemonade and Picked Raspberry. I've mentioned before but these inks are incredible! They mix and blend so perfect. I went a little further and splattered some water over the top of my blended panel. I just love how this turned out! 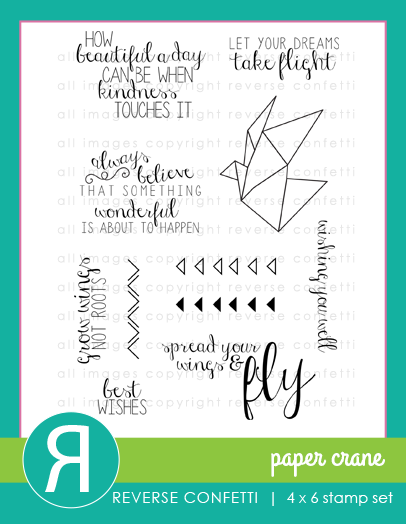 I stamped an image from Paper Crane in Slate Ink from Amuse along with a sentiment and rows of arrows. 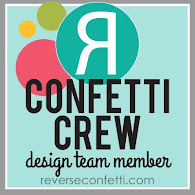 For all the details of this challenge, please head over to the Reverse Confetti blog!!! There is a winner each month and they become the 'Fetti Fave! 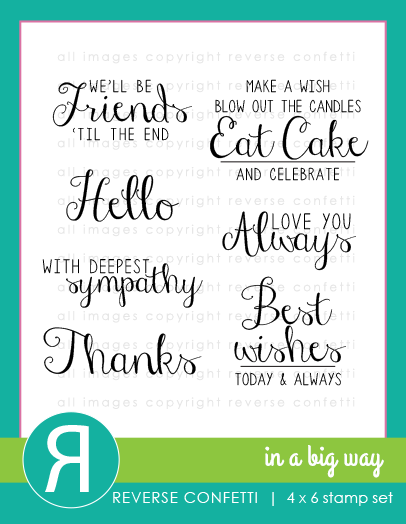 Welcome to the My Favorite Things Release Rewind! Another dose of inspiration using this month's releases......wasn't this release the bomb? Seriously? Awesome. I have to extend my thanks to everyone for all the thoughtful sweet comments about my posts for MFT this week. I also posted my projects over on Instagram and caught a lot of friends over there. Thank you ALL!!! As for helping me get everything straight, Erica from MFT helped me out a few times.....:) Thank you so much......you made being a guest a wonderful time! For my last project, I decided to use the new Proof Positive Cover-up and add a Distress Inked panel behind the cover-up. I love how all the gorgeous colors shine through! My sentiment was also done in Distress Ink blended on scratch cardstock and was diecut with the Free with $60 Die-namics set this month called.....Many Thanks. Reverse Confetti is sponsoring a sketch this week with Catherine Pooler over at Stamp Nation. 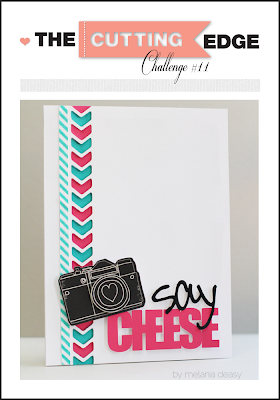 I absolutely love how my card turned but you will have to jog over to their site for the full challenge and TONS of inspiration! If you are new to StampNation, there is a trial membership for $1 that expires today! So why not give it a chance? There is so much happening over there and you don't want to miss out! Click HERE to find out about the trial! You Stole my Heart with My Favorite Things! Grateful with My Favorite Things! Verve August Release Retrospective Hop! Seasons's Greetings and a Winner! School Time with My Favorite Things! Out on a Limb with My Favorite Things! September Verve Diva Inspiration Hop!